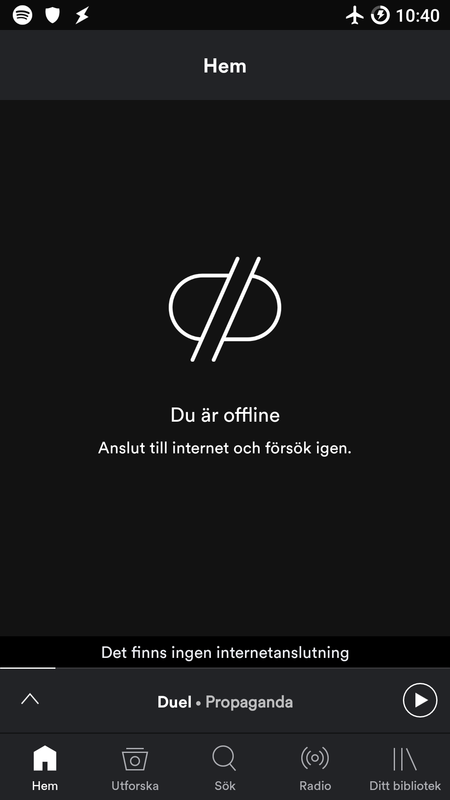 You're on the run and start Spotify and see the screen below on your android device. Please ignore the flight mode icon in the screen shot. I had to enable it to make the No connection-screen shot. Before restarting your device, which is not always an option for various reasons, try these steps. Choose Wireless connections or Connections. Choose Mobile Networks or Cellular data. You may need to first choose Data usage first. Turn Mobile data off and on. Look for a data indicator next to the signal strength bars. It should show eg 3G, 4G or LTE. If you don't see the data indicator, make sure your wifi is off. Still nothing? Follow with these steps. Pull down the icon bar at the top of the screen. Find the Airplane mode and press it to activate. Proceed to Â§7. No Airplane mode icon? See Â§4. Both wifi and mobile connection should now be off. Turn Airplane mode on again. If still no data indicator, restart your device. Press and hold the On-off button. Depending on Android version and apps installed, you may see a restart menu with several options, eg Restart, Recovery, Shutdown etc. If you have eg Prey installed and the reboot protection enabled, enter your pin first and then repeat Â§2. Then continue with Â§4. Choose Restart and wait for the phone to finish rebooting. Try either or both of the troubleshooting alternatives. 5. Still not effing working?!? If problem with data connection persists, move to an area with better reception and try either or both of the above steps. You may also want to contact your mobile service provider. Best bet if the latter, is to run over to https://forum.xda-developers.com/all, find your device model and start looking in the subforums, or just use your Google-fu!